"One way of reading the meaning of a painting is as medical charts that show what the infliction of life felt like - the temperature of pain, the colour of ambition, the texture of pleasure ... The promise of death is that I won't care or know or think or feel anything, so what happens to my work is completely meaningless." 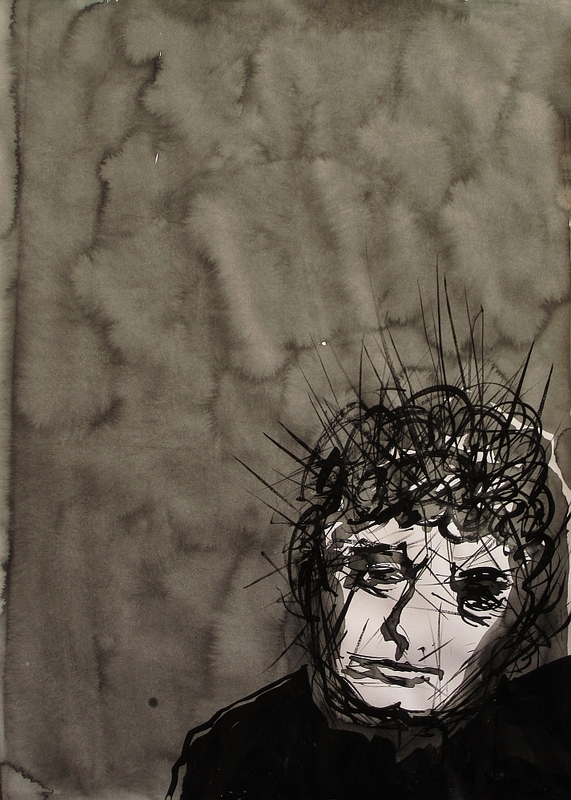 [Brett Whiteley in an interview with Rudi Krausmann for Aspect, summer issue 1975-76]. Thanks for introducing me to this artist. I'm enjoying your series and the information about him - what a statement about not being attached to things he made in that quote - wonder how many of us can say, It doesn't matter what happens to my art when I'm gone because I won't be worrying about that. Thanks for the encouraging comment, Rhonda. Glad youre enjoying the series (i suspect these ink sketches are far from everyone's cup of tea but i gotta do what i gotta do). Glad too youre finding Mr BW of interest. Thanks Olivia. Ink is a bit like watercolor (about which you know sooo much) in dry brush and wet-in-wet in techniques, so i'm pleased you like. I am in your audience, Harry, watching the construction of "Brett"--someone you'll never meet. It will be interesting; I'm not sure we ever know the people we actually do meet. As always, delighted to have you here, Hallie. Yes, i'm making up my version of Brett (not even Whiteley, if you please!) as i go along and i'm sure drifting further and further from any historical personage that those close to him knew. But how true! Do ever ever really know the people we actually meet! Heck, let's face it, do i even know myself?? I guess these these ink sketches aren't even of Brett. Let's face it, they are me looking for myself and just calling it 'Brett' for shorhand, lol. I find it a real challenge. Ink and brush gives me no place to hide - though I worry less about draughtsmanship and more letting something spontaneous well up in response to Whiteley's art and life. The more i concentrate on technical exactness, the more difficult that spontaneity becomes. Oh, this is a very powerful work. It touches me. It reminds me to a song (www.youtube.com/watch?v=myMZHDAv4XQ), unfortunately its in German: It tells from the depression and the ignorance of society to this theme. 1000 needles in your head, this I feel exactly while viewing your work. Very impressive. Perhpas my sensitivities make me unwittingly gravitate towards German Expreessionist woodcuts with their stark and edgy black and white emotive image-making, and it is on this common ground that you and i meet?